Root & Bone is coming to South Miami, and an unnamed wood-fired seafood restaurant will debut in north-central Indianapolis. Sweet tea-brined fried chicken, beet-dyed deviled eggs, and grilled mango will be on the menu when Top Chef alums Jeff McInnis and Janine Booth open Root & Bone in Miami before year’s end. Then a few months later, in late winter or early spring, McInnis and Booth will drop anchor on their first restaurant in Indianapolis, which will center around a wood-fired oven. Housed inside a former grocery store, the concept will be similar to the couple’s upscale seafood shack Stiltsville Fish Bar in Miami Beach. McInnis and Booth, who got engaged on ABC’s The Chew this past March, debuted the quaint, farmhouse-inspired Root & Bone back in 2013 in Manhattan’s East Village. Five years later, they’ve served biscuits, mac and cheese, and collard greens to neighborhood locals and celebrities like Reese Witherspoon. In September 2017, they relocated back to Miami – where the couple first met and jumpstarted their culinary careers – to open Stiltsville Fish Bar. Around the same time, they opened a small Root & Bone pop-up inside the Shelborne Hotel in Miami Beach. Located in South Miami, which is about 10 miles from downtown Miami, the permanent Root & Bone Miami will be double in size compared to the NYC flagship. 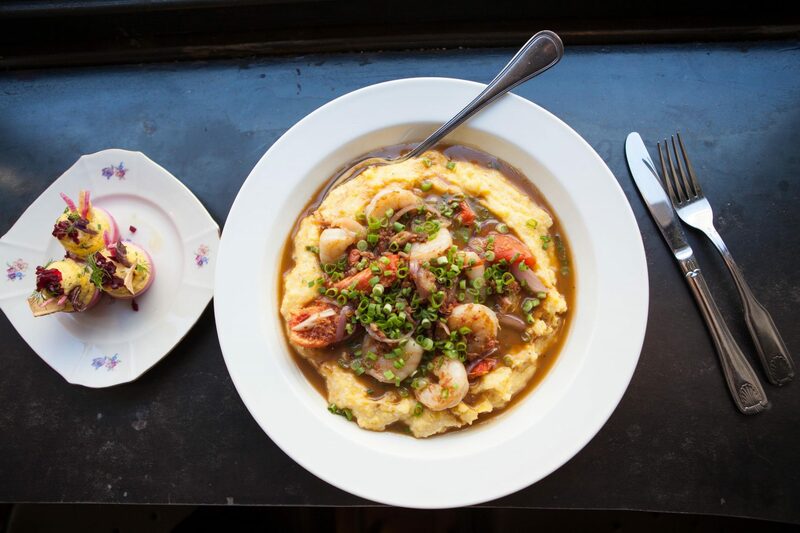 Through a partnership with Miami-based Grove Bay Hospitality Group, the menu will include McInnis and Booth’s best-selling items from up north, including deviled eggs with pickled beets, biscuits with honey chicken jus, shrimp and grits, and baskets of lemon dusted fried chicken. Expect Miami-specific items as well, such as a grilled mango salad, a Southern-inspired arepa, a selection of roasted and grilled local vegetables, and a unique spice or sauce for their fried chicken. Similar to New York, the Miami space will feature white-washed brick and wood with vintage tables and chairs. A large bar will sling whiskey and bourbon cocktails to more than a dozen high-top seats, and the kitchen will be mostly open with a window to showcase pastry chefs rolling biscuits and baking pies. As for McInnis and Booth’s wood-fired restaurant, expect their own interpretation of Florida flavors in the Midwest. Through a partnership with Tom Collins, president of Luke Family Brands (which owns Luke Oil), and restaurateur Scott Wise, the restaurant will be located in "SoBro," short for South Broad Ripple, a neighborhood in north-central Indianapolis. Expect a chef’s counter bar, as well as a chef’s table in the middle of the kitchen, where diners may be invited for a drink or a tour. A peek into the menu reveals a whole-roasted wood-fired steelhead with tarragon and Meyer lemon butter, shell and bone grilled oysters with bone marrow brown butter, hot sauce, and crunchy sourdough, a tomahawk steak with whipped uni butter, crunchy shallots, and cilantro chili chimichurri, and coconut shrimp with aji amarillo aioli. There will also be a selection of flatbreads and a variation of the couple’s fried chicken. The restaurant itself will include more than 160 seats with an expansive front porch.